On Thursday, January 24th, the space of Erling Jensen’s delightfully quaint restaurant was overflowing with food and wine connoisseurs as they welcomed the new year at the third sold-out Celebrity Chefs’ Dinner. This lively atmosphere, paired with the sweet and savory aromas permeating from the all-star kitchen, made a memorable evening for all - and all for a good cause. 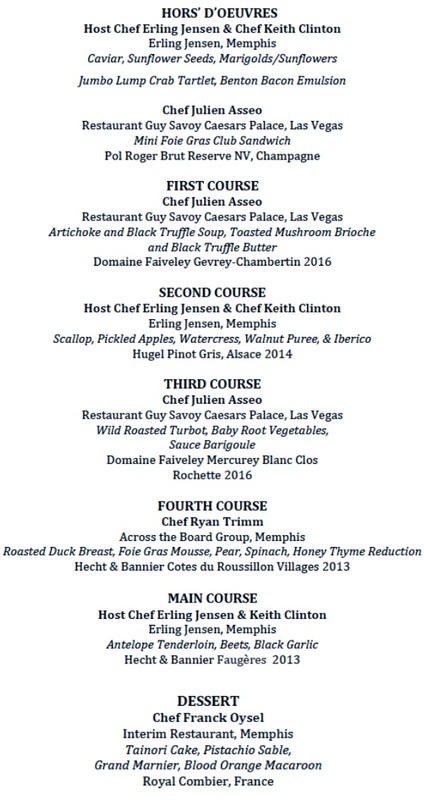 These dinners are a culinary concept cooked up by the Memphis Food & Wine Festival. This third edible collaboration featured Host Chef Erling Jensen working alongside Guest Chef Julien Asseo (Restaurant Guy Savoy, Caesars Palace, Las Vegas), and Local Chefs Ryan Trimm (Across the Board Group), Franck Oysel (Interim), and Keith Clinton (Erling Jensen). "I was thrilled to be asked to host this unique culinary concept and honored to share my kitchen with acclaimed Chef Julien Asseo," remarked Host Chef Erling Jensen of the event. Foodies will recall Caesars introduced Memphis to French Chef Guy Savoy at the 2017 Memphis Food & Wine Festival. Starting with Hors’ D’Oeuvres through the Fourth Course to the Main Course and Dessert, menu items included Jumbo Lump Crab Tartlets with Benton Bacon Emulsion, Artichoke and Black Truffle Soup, Wild Roasted Turbot with Baby Root Vegetables and Sauce Barigoule, and Antelope Tenderloin with Beets and Black Garlic. Guests finished off the extravagant meal with a beautiful creation of Tainori Cake, Pistachio Sable, Grand Marnier, and Blood Orange Macaroons. Each course featured a carefully paired wine from Frederick Wildman and Sons with Pol Roger Brut Reserve NV, Champagne starting the evening. Special thanks go to dinner sponsor Ellichman Vein & Vascular Centers for helping make this elegant evening possible. Memphis Food & Wine Festival benefits FedExFamilyHouse with each Celebrity Chefs’ Dinner and with the main Memphis Food & Wine Festival - October 12, 2019 at Memphis Botanic Garden. With the support and generosity of many, MFWF has donated over $225,000 to FEFH thus far. After the 2017 Memphis Food & Wine Festival Guy Savoy named our event his "favorite place to garden party” … Julien put the word out he was ready to come to Memphis himself this time … and here we are! Julien Asseo is a seasoned culinary professional, bringing with him knowledge and expertise as he oversees operations of Michelin-starred restaurant, Restaurant Guy Savoy. 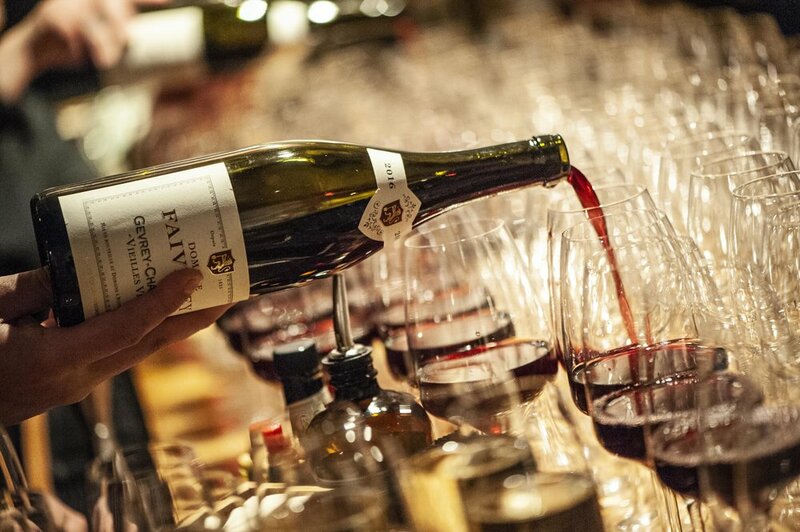 Hailing from Libourne, a small town in the southwest of France, Asseo’s passion for food and wine was ignited by his experiences at his parents’ vineyard. At the age of 16, Asseo decided to follow his passion for all things food by studying at the Lycée Hôtelier de Gascogne near Bordeaux, where he obtained a Bachelor of Arts in culinary arts. After finishing culinary school, Asseo moved to Paris to work at La Fontain de Mars, where he advanced from commis to chef de partie quickly. After spending some time in Paris, Asseo decided to take his skills to America, where he had the unique opportunity to open Rivera in Los Angeles as sous chef. In 2009, Asseo decided to bring his culinary talents to Las Vegas, with its recent burgeoning culinary scene. He worked under renowned chefs Rick Moonen and Joel Robuchon in their Las Vegas establishments before taking a position at Restaurant Guy Savoy. Throughout his time at Restaurant Guy Savoy, Asseo studied extensively under Chef Savoy, as well as former executive chef Mathieu Chartron. In his role as executive chef, Asseo continues the legacy of expertise and quality of food of which Restaurant Guy Savoy is emblematic. Chef Erling Jensen was born in Frederikshavn, Denmark, and started cooking at the tender age of 14. After training at a fou-year culinary school and serving his apprenticeship at the Hotel Jutlandia in Frederikshavn, Erling moved to the United States to be Chef at the Danish Embassy in Washington, DC. After two years in Washington, DC, Erling was hired by Danish Chef / Restauranteur Jorgen Mueller to be Executive Chef at the Prince Hamlet Restaurant in Miami, Florida. Erling then applied to be Chef at La Tourelle, a French restaurant in Memphis after reading a one time ad for the position in the New York Times. Erling called the owner, Glenn Hays, and was hired over the telephone! Jensen and his family moved to Memphis in 1989. During his tenure at La Tourelle, the restaurant received the highest culinary ratings in its history and was voted Memphis’ “Best French Restaurant” for several years in a row. In addition to La Tourelle, Erling also became First Tennessee Bank’s Corporate Executive Chef. Chef Ryan Trimm was in born in Pittsburgh, PA and spent the majority of his early childhood in Southern California. He moved to Memphis at the age of twelve and stayed here through graduation from Christian Brothers High School in 1998. Ryan went on to study English and Business at Ole Miss. During college he discovered his love for cooking. He worked in his first fine dining restaurant the summer after his freshman year. Ryan worked at The Carlton Restaurant in Pittsburgh, PA. He enjoyed the summer so much that he started working for a new restaurant in Oxford, 208 South Lamar. Upon graduation Ryan moved to Charleston, South Carolina where he attended Johnson and Wales University and more importantly found a job working under Chef Frank Lee at Slightly North of Broad. He considers his years spent at S.N.O.B. the most influential in his career, crediting Lee’s direction as the basis for his broad kitchen skills and development of his palate. Ryan moved back to Memphis in 2005 and started working at the Grove Grill. He spent over four years there as the Chef de Cuisine, until he opened Sweet Grass in April 2010. The following year they opened Sweet Grass Next Door, a casual sports restaurant and bar. In the two years that it has been open, Sweet Grass has won such accolades as Best New Restaurant and Best Bar in multiple Memphis publications. In addition, Ryan was nominated for Food and Wine’s Peoples’ Best New Chef 2011. Ryan has been invited to cook in several festivals and showcases from Portland to Boston. And in 2014, Ryan was asked to participate in a Friends of James Beard benefit dinner with seven other local chefs; they prepared a six-course “Made in Memphis” dinner at the exalted James Beard House New York City. In 2017, Ryan Trimm partnered with Craig Blondis and Roger Sapp of Central BBQ to open Sunrise Memphis, an eclectic diner specializing in classic breakfast favorites and house prepared artisan meats. The trio recently opened 117 Prime to recreate the traditional American steakhouse. The goal is to provide above the bar cuisine with an approachable atmosphere. It was important to the Across the Board Hospitality Group to bring you all of the classic favorites prepared with love and Southern charm that they have become known for. Born and raised in France, Franck has been working in classic French pâtisserie with Master Chefs since he was 15 years old. Franck has cultivated a rich passion for sharing the culinary arts — by teaching others — as well as producing refined and balanced products. In 2006 Franck became the Executive Chef de Pâtisserie with a Master Chocolatier at one of the popular pâtisseries in the Jura region of France, Aux Plaisirs Sucrés. In 2014, Franck moved to America, following the love of his life, an American who taught English in France and volunteered at the pâtisserie. Franck is the executive Pastry Chef at Interim where the importance of producing high quality dishes that appeal to all of the senses is emphasized.